SAN ANTONIO - A post claiming Whataburger will release its first ever James Avery charm next week is going viral. 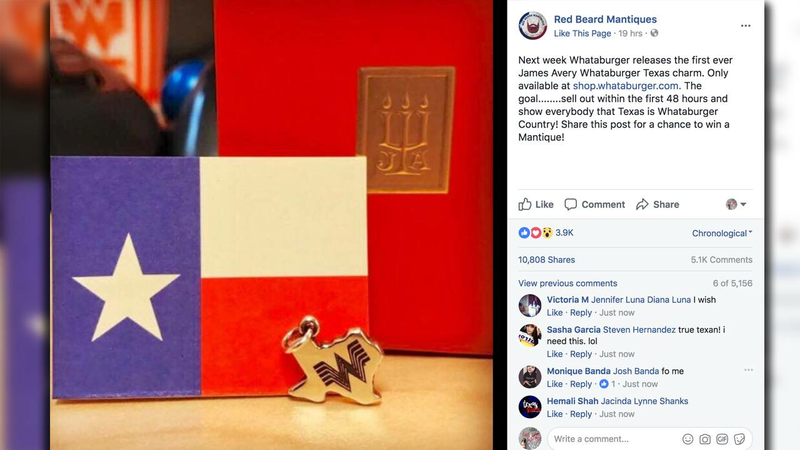 On Friday Red Beard Mantiques posted a photo of the charm and said the Texas fast food giant intends on releasing the Texas shaped charm to the public next week. Next week Whataburger releases the first ever James Avery Whataburger Texas charm. Only available at shop.whataburger.com. The goal........sell out within the first 48 hours and show everybody that Texas is Whataburger Country! Share this post for a chance to win a Mantique! The post has been shared more than 11,000 times and has more than 4,000 interactions. According to the antique vendor, the charms will be available on Whataburger's online store. One commenter shared a photo of a charm identical to the one posted by the antique shop and said Whataburger's corporate employees get early access to newly released items. The claim hasn't been confirmed by Whataburger representatives. Requests for comment from Whataburger and Red Beard Mantiques were not immediately returned Saturday afternoon.